This is the year—your senior year is finally here! We trust you are looking forward to it as much as we are. For some of you, it must have seemed like this year took a long time to arrive. For others, the time has flown by. Regardless of perspective, few times in life are more special than your senior year. More than any other year, you will create memories for a lifetime. This year is yours; it can be anything you want it to be. Put another way, this year is a blank page and you are the author—what story will you fill your page with? How will you use your time? How will you and others grow as a result of what you accomplish this year? I have always believed that much of the success of a high school year depends on its senior class. You set the tone for everything. As Seniors, your pride, how you treat people, and, most of all, your leadership will impact North more than any other group. As you likely have seen in your time at North, being a Senior is something Raiders look forward to for much more than the fact that it is your last year of high school. Seniors at North are trusted with leadership, privileges (for example our unique ID pictures), and a significant voice in the running of the school. Moreover, as Seniors, you wield a powerful influence upon the culture of our school and our community. You play a dual role of being the keepers/preservers of our school culture and, at the same time, the architects of how our culture needs to grow. The legacy that you create together will depend on each senior accepting her/his responsibility of choice, voice, and progress. What will your contribution be to what it means to be a Raider? How will you leave others better off than you found them? How will you get better at what you do every day? How will you help others do the same? Over your four years at North we, students and staff, have cut in half the number of failures and helped ensure that over 90% of students grades are A’s, B’s, or C’s. We reduced failures to 3% of all grades or fewer for the last two school years running! This changes lives! We want your help as role models, tutors, LINK leaders, and peers to help us push to even higher levels of student success! We will begin bond construction later in the year and your input will be valuable in shaping what North will look like and feel like for decades to come. We are an amazingly diverse school in and amazingly diverse community. We want your help in celebrating, valuing, and preserving that diversity by joining us in ensuring that North Farmington High School is a safe, caring, nurturing and effective environment for all of our learners–students, staff, and families. It is impossible to miss that a good deal of the discourse in our current society has grown courser, angrier and more divisive. We need your help in living up to the Raider tradition of being kind, collaborating, celebrating the value diversity brings, and leaving each other better off as a result of our interactions! We have every reason to believe that you will have a great year and can set a high bar for all classes to follow. The faculty, staff, and administration want to do everything possible, together, to make that happen. I will look to you for help in fostering the great culture and traditions of North while also finding ways we can further enrich North. You will be so instrumental in passing on our culture with both staff and younger students. Each of you has the chance to ensure that you are better prepared than any other student out there for what the future might hold by motivating yourself to make your senior year challenging and rewarding all the way through to graduation. The future is yours to build starting now and we want to prepare you and help you get started. We are proud of the class of 2018 and are eager to work with you on your senior year. Mark you calendar: Seniors paint the rock at 8:00 pm on Labor Day night, Monday, September 4th! Be there…bring paint (seriously)! Finally, let’s make a commitment to each other that when we get to June 2018, we have no regrets, we have all grown for the better, and we have made it a great year to be RAIDERS! We have received word that road construction has been completed in front of North Farmington High School. It is worth noting that the new road configuration has only one lane running in either direction with a bike lane on either shoulder. This will impact traffic patterns as we live into it so we would ask that you still remain aware and exercise caution driving to and from school. Parents that are dropping students off can drop students off by entering the front drive from the east entrance or as they have been off of Farmington Rd via Raider Ralph Lane. Students are still encouraged to enter as they have been from Raider Ralph Way in the mornings. Due to the lane configuration changes we are working with the city to re-examine our drop and pick up traffic patterns to ensure the safety of students, staff, parents, and community members. As we conclude our review, we will communicate any changes to our expectations/procedures for drop off and pick up that might be necessary. Thank you all again for your patience, understanding, and accommodations during the disruption caused by this construction project. Welcome To Your Senior Year Class of 2017! Posted on September 1, 2016 | Comments Off on Welcome To Your Senior Year Class of 2017! It’s finally here! This is the year; the culmination of thirteen years of education—your senior year! We trust you are looking forward to it as much as we are. There is every reason to believe that you, like the classes that preceded you, can set a high bar for all classes to follow. You have the powerful opportunity to define your identity as a class, your self as a young adult, and your lasting impact on North Farmington and the Raider tradition. With this also comes the powerful responsibility of setting the tone and modeling for underclassmen what it means to be a Raider. The faculty, staff, and administration want to do everything possible, together, to help you make that happen. We believe that a great deal of the success of each school year depends on its senior class. You set the tone for everything. Consequently, your pride, your decency, your treatment of others, and, most of all, your leadership will impact North more than any other group. The legacy of North and your own identity that you create together will depend on each senior accepting his/her responsibility of voice, action, and progress. The bar has been raised high by those who have preceded you—much is expected of you, individually and collectively. For some of you, it seems like this year took a long time to arrive. For others, the time has flown by. Regardless of perspective, your senior year has arrived, and few times in life are more special or defining. Not only will you create memories for a lifetime, but more than any other year, this year can help you define the person you want to be in the world and the mark you want to leave upon it. This year is yours; it can be anything you want it to be. Put another way, this year is a blank page and you are the author—what story will you fill your page with? The 2016-2017 school year offers great opportunities for all of us: On a school-wide level, our administrative team will look to you to help foster the great culture and traditions of North and find ways that we can continue to further enrich North. Each of you, and your class collectively, will be critically instrumental in preserving and passing on our culture with both staff and new students. On an individual and class level, as you prepare for, and live into, an exciting and constantly evolving future, you have the chance to ensure that you are better prepared than any other students out there by motivating yourself to make your senior year challenging and rewarding all the way through to graduation. Our consistent challenge to you will be to ramp up your efforts this year, finish strong, and prove to yourself what you are truly capable of by the team your Senior fanfare arrives. In this way, when you leave North, you will be ready, poised, and confident to face the challenges and opportunities the world will present you and you will know you have left North better than you found it. The future is yours to build starting now; our task is to prepare you, provide support, and help you bring that to fruition. I am so eager to see all of you back, to collaborate with you on making this a great year, making North one of the best schools in the nation, and helping each of you on your journeys to becoming some of the most capable, compassionate, and talented young adults able to compete in the 21st Century. Along the way, we will look to the senior class for leadership, kindness, and enthusiasm in building the kind of place each of us will cherish and can be proud of. Senior Raiders, welcome back to North! P.S. Mark you calendar: Seniors paint the rock at 8:00 pm on Labor Day night, Monday, September 5th! Be there…bring paint! This will be a great year to be RAIDERS! Comments Off on Welcome To Your Senior Year Class of 2017! This message is being presented in multiple formats. You can read the message in written forms with diagram in the rest of this document or you can watch a videocast of the same information at the links below. This is an important message to inform you about adjustments we will need to make in light of the road construction work on 13 Mile Road. The roadwork in front of the school is estimated to be finished by November 1st and will entail closing the east entrance to school grounds off of 13 Mile to rebuild it, followed by closing and rebuilding the west entrance off of 13 Mile. Traffic will be significantly restricted in front of the building in general due to lane closures. As a result of these impacts we have collaborated with the city and determined that we will need to significantly re-route school traffic. These changes will be in effect from the first day of school, September 6th, through the completion of the road work which is estimated to finish by November 1st. We would ask your cooperation and patience with these adjustments. If you have an option to take a bus to school, we would urge you to consider this as it would help cut down on traffic and better ensure that you arrive to school on time. If you live within walking distance, we would urge you to consider walking instead of driving as it will cut down on traffic and could likely take less time than driving given traffic. We would urge you to leave for school early as traffic will cause delays. We want to remind students and parents that school is open at 7:00 AM and students can come early as we will have a supervised area in the cafeteria for students to utilize before school. There will certainly be delays in departing school as a result of this construction. We would ask you to exercise patience and awareness in order to safely leave school grounds with as little stress and risk as possible. If you have after school commitments we would advise you to work with pertinent parties to arrange for potential delays after school. Deliveries – We have made appropriate arrangements for this. Emergency Services – We have made appropriate arrangements to ensure the safety and well-being of students, staff, and guests. 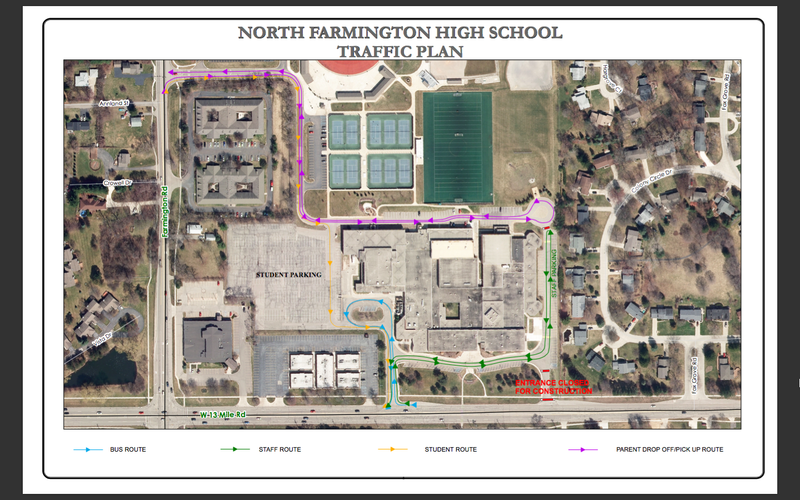 The city of Farmington Hills collaborated with our administration to develop a solution for each of these types of traffic. Our primary concerns in devising these new routes were safety and the ability for students to be able to arrive to school on time. Please pay particular attention to your route as each will be described in words below and in graphic format as well. It is necessary that you please do not deviate from these routes as we are trying to maintain student and community safety as well as efficiency. ARRIVING AT SCHOOL IN THE MORNING: It is necessary that you enter school grounds from Farmington Rd onto Raider Ralph Way as you will not be able to enter school grounds from 13 Mile Road. You will follow Raider Ralph Way around to the student lot entrance where you will turn right into the student lot. Your route is the GOLD ROUTE on the graphic of the map. Parking spaces are no longer numbered, so they are first come first serve. It is necessary that while we are dealing with this construction that no students park in any of the spaces along the east side of the parking lot along the wall and side of the building. We will need to reserve these spaces for visitors. LEAVING SCHOOL IN THE AFTERNOON: When leaving school it is necessary that you exit the student lot from the southeast gate near the bus roundabout, after the buses have left, as the north gate will be closed. As you exit the student lot, you will then turn right to exit onto 13 Mile Road where you will be able to exit to the right off of school grounds onto 13 Mile Road. We recognize there will be a small delay as you wait for the buses. Your route is the GOLD ROUTE on the graphic of the map. ARRIVING AT SCHOOL IN THE MORNING: It is necessary that you enter school grounds from Farmington Rd onto Raider Ralph Way as you will not be able to enter school grounds from 13 Mile Road. You will follow Raider Ralph Way around past the student lot entrance continuing on along the rear of the building until you reach the Senior Entrance between the pool and auxiliary gym. This is where you will drop students off. Please do not enter the student lot during drop off or pick up times as we have young drivers and we want to minimize the amount of competing traffic and potential driving hazards they face. Once you drop your child off it is necessary that you continue along the back of the building to the turnaround at the northeast corner of the school. Once there you will follow the turnaround and head west back along the rear of the school, onto Raider Ralph Way, following that around to exit school grounds back onto Farmington Road. Your route is the PURPLE ROUTE on the graphic of the map. LEAVING SCHOOL IN THE AFTERNOON: At the end of day It is necessary that you follow the same pattern as the morning. It is necessary that you enter school grounds from Farmington Rd onto Raider Ralph Way as you will not be able to enter school grounds from 13 Mile Road. You will follow Raider Ralph Way around past the student lot entrance continuing on along the rear of the building until you reach the Senior Entrance between the pool and auxiliary gym. This is where you will pick students up. Once you pick your child up it is necessary that you continue along the back of the building to the turnaround at the northeast corner of the school. Once there you will follow the turnaround and head west back along the rear of the school, onto Raider Ralph Way, following that around to exit school grounds back onto Farmington Road. Your route is the PURPLE ROUTE on the graphic of the map. ARRIVING AT SCHOOL IN THE MORNING: It is necessary that you please enter school grounds from Farmington Rd onto Raider Ralph Way as you will not be able to enter school grounds from 13 Mile Road. You will follow Raider Ralph Way around to the the student lot entrance where you will turn right into the student lot and park in the spaces to your left marked with signs for visitors. Your route is similar to the GOLD ROUTE on the graphic of the map. It is necessary that you exercise extra care as you drive to school if you are entering the student lot while students are arriving to school in order to help us keep everyone safe. We would also encourage you to consider arriving at school from 8:00 AM onward into the day as you will miss the morning traffic arriving at school. To enter the building we would ask you to follow the signs that direct you around to the front of the school where guests enter and sign in at the main office. LEAVING SCHOOL IN THE AFTERNOON: When leaving school It is necessary that you please exit one of two ways depending on the time of day. If you are leaving prior to 2:15 It is necessary that you exit out the north entrance of the student lot (the same one you entered through), turning left onto Raider Ralph Way, following that around to exit school grounds back onto Farmington Road. Your route in this case is similar to the PURPLE ROUTE on the graphic of the map. If you are leaving school after 2:15 It is necessary that you exit the student lot from the southeast gate near the bus roundabout, then turn right to exit onto 13 Mile Road where you will be able to exit to the right off of school grounds onto 13 Mile Road. Your route is similar to the GOLD ROUTE on the graphic of the map. ARRIVING AT SCHOOL IN THE MORNING DURING THE FIRST PHASE OF WORK: During the first phase when the east entrance of 13 Mile Road is closed for construction, It is necessary that you please enter school grounds from 13 Mile Rd via the west entrance near the rock. You will then turn right along the front drive to cut back over to the staff lot on the east side of the building. Your route is the GREEN ROUTE on the graphic of the map. LEAVING SCHOOL IN THE AFTERNOON DURING THE FIRST PHASE OF WORK: During the first phase when the east entrance of 13 Mile Road is closed for construction, It is necessary that you please leave the staff lot by heading west along the front drive, turning left to exit school grounds via the west entrance near the rock. You will only be able to exit by turning right onto 13 Mile Rd. Your route is the GREEN ROUTE on the graphic of the map. ARRIVING AT SCHOOL IN THE MORNING DURING THE SECOND PHASE OF WORK: During the second phase when the west entrance of 13 Mile Road by the rock is closed for construction, It is necessary that you please enter school grounds from 13 Mile Rd via the east entrance right into the staff lot. This adjusted route will be posted on a graphic at the change of phase in the work and will be denoted as a GREEN ROUTE on the graphic of the map. During the second phase when the west entrance of 13 Mile Road by the rock is closed for construction, It is necessary that you please leave the staff directly by the east entrance where you will only be able to exit by turning right onto 13 Mile Rd. This adjusted route will be posted on a graphic at the change of phase in the work and will be denoted as a GREEN ROUTE on the graphic of the map. ARRIVING AT SCHOOL: During the first phase when the east entrance of 13 Mile Road is closed for construction, it is necessary that you please enter school grounds from 13 Mile Rd via the west entrance near the rock. You will then turn right into the front drive and park in the handicapped accessible parking spots on either side of the flagpole in front of the building. Your route is similar the GREEN ROUTE on the graphic of the map. LEAVING SCHOOL: During the first phase when the east entrance of 13 Mile Road is closed for construction, It is necessary that you please leave the front drive heading west, turning left to exit school grounds via the west entrance near the rock. You will only be able to exit by turning right onto 13 Mile Rd. Your route is similar to the GREEN ROUTE on the graphic of the map. Announcing North Farmington High School’s 2016 Distinguished Alumnus – Dr. Ken Massey! Posted on May 31, 2016 | Comments Off on Announcing North Farmington High School’s 2016 Distinguished Alumnus – Dr. Ken Massey! North Farmington High School is thrilled and proud to announce Dr. Ken Massey, Mayor of Farmington Hills, as our 2016 North Farmington High School Distinguished Alumnus! As we considered our nominees this year Dr. Massey truly stood out due to his accomplishments and impact within the medical profession, his civil service, and his community involvement giving back to the community. Dr. Ken Massey is a lifelong resident of Farmington Hills and proud member of the North Farmington High School class of 1976. 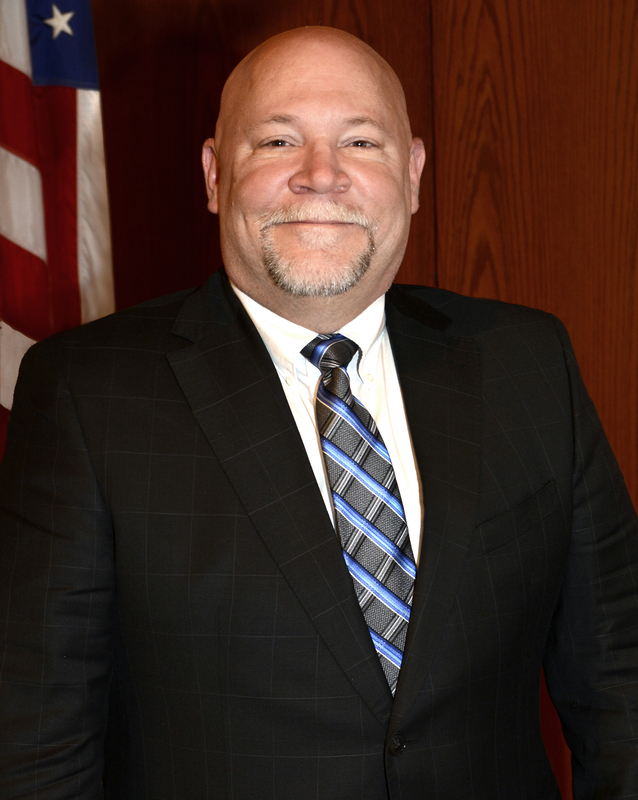 He was elected Mayor of Farmington Hills in 2015, following 12 years as a member of the City Council. Community involvement has been an integral aspect of Ken’s life from an early age with his participation in civic groups and in scouting, where he earned the rank of Eagle Scout. In addition to council, he has served the community in a number of ways. Ken is a member, and past chair, of the Farmington Hills/Farmington Emergency Preparedness Commission, a founding member and chair of Farmington SAFE, and advocates nationally for Farmington Hills as a member of the National League of Cities Public Safety and Crime Prevention Steering Committee, serving as chair of the organization in 2012. He is a board member of Farmington Youth Assistance, past President of the Farmington Area Council of Homeowners Associations and remains an active member of his subdivision’s homeowner’s association board. He has also served as the Chairman of the Board of Directors of Botsford Hospital. Ken holds a Bachelor of Science degree from Eastern Michigan University, a Ph.D. from the University of Texas Southwestern Medical School, and completed fellowships at the University of Arizona and the Michigan Hospital Association. Professionally, Ken is a biomedical scientist and Senior Director of Commercialization at Wayne State University. Ken and his wife Katherine are proud to continue to call Farmington Hills home. Our distinguished alumni are chosen because they are exemplars of what it means to be a Raider and of the spirit of True North. Dr. Massey more than meets this standard and is truly worthy of this honor. As is tradition he will speak to our graduates at commencement on June 12th. Dr. Massey’s voice and experiences fit well with the spirit of the Raider Class of 2016 and, as our graduates take this first step out into their futures, his tremendous example of what a Raider can accomplish in the world once they leave North will both resonate well with them and inspire them! Comments Off on Announcing North Farmington High School’s 2016 Distinguished Alumnus – Dr. Ken Massey! After long deliberation with both faculty and administration we are sorry to inform you all that we will not be having The NORTHYs this year. With the time crunch, event calendar mishap, miscommunication, lack of teacher supervision needed for this event and a plethora of other obstacles, it is just not feasible to run such a cool event amidst these challenges. Though there is somewhat of good news. After realizing the great amount of hype that the promo for this event caused, administration has offered to support P.O.W.E.R., with the support of Senior Board, running the event next school year. We will begin writing out the plan for this event this summer and make sure that it is on the calendar earlier in the year. We want to thank you for your interest, energy, and excitement around the idea of the NORTHYs. Once again we apologize for this disappointing news and hopefully we can run an amazing NORTHYs next year! TONIGHT March 1st – The Board of Education meeting will occur here at NORTH FARMINGTON HIGH SCHOOL at 7:00pm (Changed to North to allow live broadcasting through TV 10). Dr. Heitsch will be making a formal building and site utilization recommendation to the Board for a vote on March 15th. I will be sending out an email later this week with details related to the recommendation. Thursday March 3rd – The first of two community forums for the board to hear feedback on the recommendation. This will be held at the 10 MILE MAXFIELD TRAINING CENTER at 7:00pm. Saturday March 5th – The second of two community forums for the board to hear feedback on the recommendation. This meeting will be held at DUNCKEL MIDDLE SCHOOL at 10:00am. Tuesday March 15th – The Board of Education is slated to vote on the recommendation. This meeting will take place at FARMINGTON HIGH SCHOOL at 7:00pm. I will again be sending out an email based on the outcome of that meeting later that week. This information can also be found at the bottom of the district homepage at http://www.farmington.k12.mi.us/. As always, thanks for helping make it a great day to be a Raider!